The End of One Year, The Start of Another. Happy New Year’s Eve, everyone! Today marks the 9th year of this blog! I started it at a time in my life that wasn’t great, and I wanted to just … start over, be someone else. I don’t know exactly. But what ended up happening is that I became more myself than ever. And that’s a good thing. This wasn’t my Best Year Ever. But it wasn’t all that bad either. On the RL side of things, I didn’t lose anyone, and that makes me enormously grateful. Considering the 2016 that some people have had, the fact that all of my loved ones are still alive is basically the only thing I could have asked for. In SL, I’ve definitely had ups and downs this past year. But more ups than downs. I love my partner of over 5 years, and he is always so patient and supportive of me. I love my little girls. I love the rest of the family. I love the life we’ve created and I’m so thankful that we’re going into yet another year together. 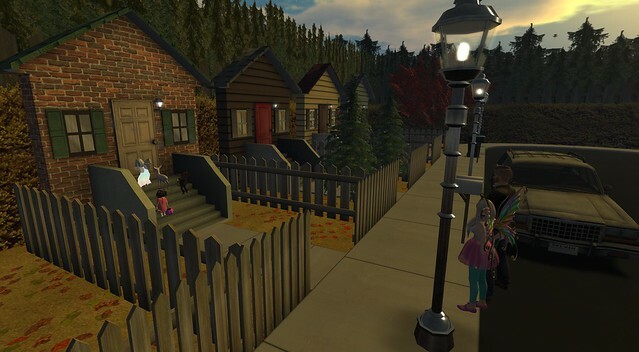 This year in SL, it even took me to a new place – YouTube! I never ever thought that I would be vlogging on YouTube. I didn’t think that anyone would want to watch a random SL avatar doing mostly non-fashion, almost always non-trolling things. But they do! And not only do they watch, they interact with me in a way that I never would have expected. It’s amazing and sometimes a little scary [like when people just show up in our house just to “look around.”] but still something that I am just loving to do. What astounds me every year is that SL always seems to have something to teach me. Just when I think I’ve learned all the lessons possible, it puts another one in my lap. Not just about photos or how to do things. But just life lessons. This past year taught me that I do have to know where my boundaries are. I have learned when to pull back when I have given as much as I could, and not to try to give more when it is not making me happy to do so. I often put myself last when it comes to what I want because I so badly want everyone else to have what they want first. This doesn’t work in the long run because I become resentful that my needs aren’t being met when it’s my fault that I didn’t say what I needed in the first place. That’s definitely a lesson I’m taking with me from 2016 – for both my worlds. So what’s coming up for me in 2017? Well, more videos, obviously. I want to learn more about my chosen editing program, and make more content that people will like to watch. I’d like to be more social, and maybe make a few closer friends. Or at least one. *laughs* And of course, I want to keep on with my blogs. Yes, even this one, although I think vlogging will take priority over this blog. I guess I could update this one with my videos when I put them out? We’ll see. But most importantly… I think I’m going to give myself a rest this 2017. Not take a break. But just give myself a rest from this constant fight I have with my body, and this need to compete against everything and anything. I live my days in this near constant state of anxiety because I’m always attempting to do the perfect things that I feel like I’m supposed to do, and then everything overwhelms me so quickly because I know I can’t control everything. Emotionally, my mind is exhausted. Physically, my body pretty much is, too. Maybe if I were kinder to myself, things that I want to accomplish would just happen in their own time if they are meant to happen. I’d kind of like to find out. Happy Easter, dear ones! We had our Easter party with the family and it was lots of fun!! Then we headed out to Easter Town to hunt eggs and race peeps! We did this last year, too, but it’s always fun and the prizes are always different. 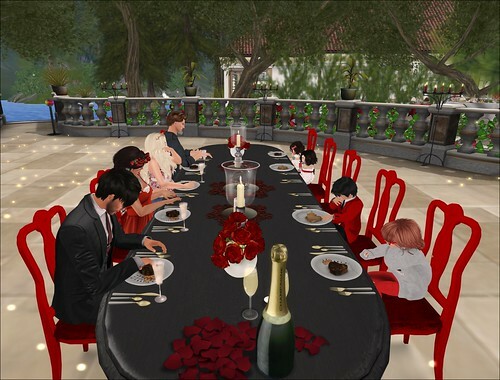 I love that the people who own the sim always do cool things for holidays. They’re the ones who did the Halloween town and the winter area. It is also family friendly, which of course is something we look for when we head out with our little ones. 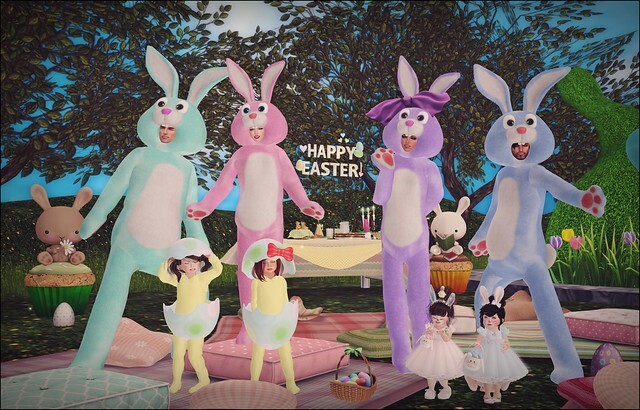 Of course, you still might see some people who don’t get that it’s more of a family friendly sim [despite the bright colors, bunnies, and , but that’s pretty much true anywhere anyone goes. Happy 2015! Since the Grand Canyon was empty tonight, I headed over after changing out of my party clothes and took a walk around the place. Just to think, mostly. This coming year, I mostly want to try a little harder in things that I already do. For instance, my style blog. I think that I do some decent pics these days, and I like writing a little something about what I’m wearing, and I think that I do a pretty good job of crediting items. But I’m awfully sporadic with it. I just blog when I happen to feel like it and that means that I use very little of what I’m given. [At least, on the blog. I actually use more stuff in just my everyday SLife than I show on the blog.] So I want to try to get myself on more of a schedule for blogging. Or, at the very least, try for more than just once a week. I’ve been doing this for over 5 years, I feel like I would probably be more well known as a fashion blogger if I actually did it more often. I also want to try a little harder in my friendships with people. I think that people take my silence for disinterest sometimes, and that’s not really the case. I’m simply used to being the one who waits to be spoken to. 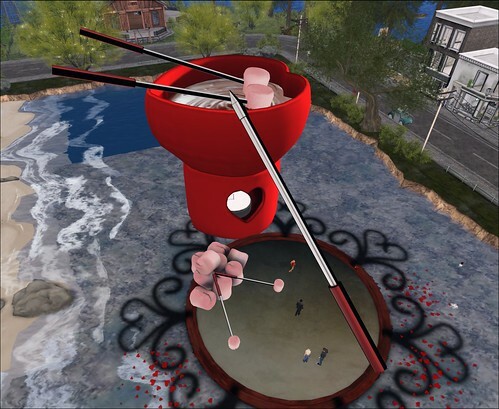 This is not just something that occurs in SL, either. It’s just that I’m used to being the listener and so I tend to wait until I’m needed. But this also means that I don’t cultivate my friendships as I should. I get left out of a lot of things because I guess I seem like I’m not interested since I don’t speak up. So that’s definitely something I want to work on. And then, of course, I am always striving to be a better SL mom and wife and sister and aunt. They tell me I’m fine, but I know I could be better. I want to be better for them. Do you guys make resolutions or goals or have a “try harder” list for the new year?